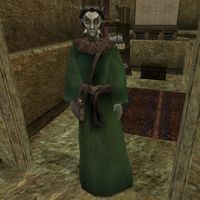 Dralval Andrano is a Dunmer apothecary who works at the Temple in Balmora. There he sells all manner of alchemy supplies to all who need them. He is wearing a common robe and a pair of matching shoes. Aside from his natural resistance to fire and the sanctuary provided by his ancestors, he knows the following spells: Deadly Poison, Dire Weakness to Fire, Dire Weakness to Frost, Dire Weakness to Magicka, Dire Weakness to Poison, Cure Poison, Seryn's Gift, Resist Fire, Rest of St. Merris, and Great Heal Companion. This page was last modified on 23 November 2018, at 06:34.